UPDATE: Sean, being objectively one of the coolest people on Earth, actually used this illustration for the podcast! Go check it out right here! A few weeks back I wrote in to the seanwes podcast about some trouble I was having feeling like I was cramming too much stuff into my head. They did an episode about it called Content Consumption Burnout. It was a great show, and they talked about the idea of how to carefully manage your intake of content, especially when you’re watching or listening to things for the purpose of making a business grow. I felt inspired to make a thumbnail image for the show, and it took until today to figure out what I wanted to do. The title of the episode is Content Consumption Burnout. It might not be my specialty (character design), but I still wanted to reflect that idea visually, and a set of matches seemed the best, well, match, for representing the concept. A couple of principles are in play in this image. One is the individual terms each represented by a match. Content. Consumption. Burnout. Content is the first match. An object that contains ideas, which is the raw material that must be forged by action in order to produce results. Consumption is the second match. The consumption of content produces something in a listener. Whether that is an emotional reaction, or the inspiration to take some sort of action, the consumption of the content creates one form of energy at the expense of another. Burnout is the third match. Burnout simply happens. Attention and focus are finite resources, and require energy on the part of a listener to maintain. In the same way that a match must be properly managed in order to produce fire, one’s attentive energy must be properly managed in order to maintain momentum in moving toward one’s goals. The consumption is the most noticeable match in the image simply by the fact that the consumption is the most active process happening all the time all around us. We all consume every day, and we make choice about that consumption, whether proactive or reactive. The burnout is a bit less noticeable in the image, and that is for a reason. If you do not know that you need to be looking out for burnout, you may not be able to pick up that it’s there, and it’s happening. Such is true both for general burnout, as well as for burning out on the consumption of content. If you feel like you might be running up against burnout in your life, it might be work checking out Sean’s show on the topic. 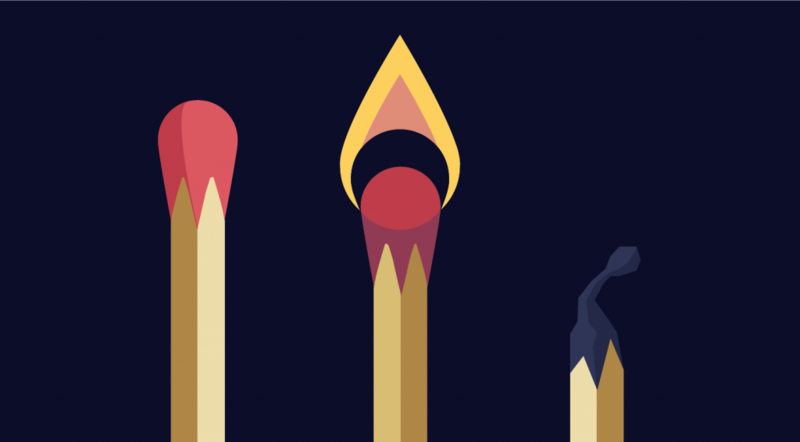 There’s one on Content Consumption Burnout and one on Avoiding Burnout in Life. This image was produced after several weeks of consideration, and only came to a solid iteration once I came to the right concept to approach this thumbnail with. Because I was able to arrive at the right representative idea, and had a focused concept to work with, this illustration came about in a matter of just one day. I’m really grateful to Sean and Ben for taking the time to address the problem I was having, and I hope that they get some use out of this illustration. Do you need an illustration or character design solution? Does my work match the profile of your design problem?